Dr. Binfet received his Ph.D. from the University of British Columbia in Educational Psychology and is now an associate professor in the Faculty of Education at UBC Okanagan. He is the founder and director of UBC's dog therapy program "B.A.R.K." (Building Academic Retention through K9s). 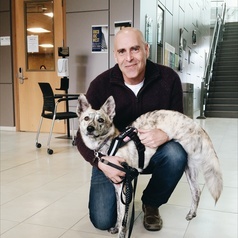 In addition to researching the effects of spending time with therapy dogs on university students' well-being, Dr. Binfet researches children and adolescents' conceptualizations of kindness in school.